For a game that looks and runs like clockwork, City of Gears has plenty of electrical spark running through it. Enhance your Tabletop Gaming reading experience with extra digital content, just a tap or click away! Watch gameplay videos, trailers, extra reviews, picture galleries, audio and more – for free! 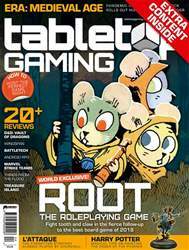 Root: The Roleplaying Game: Last year’s acclaimed board game of woodland warfare sets off on a new adventure. Co-designer Mark Truman tells us what to expect and gives us a first look at the RPG in a world-first in-depth interview. 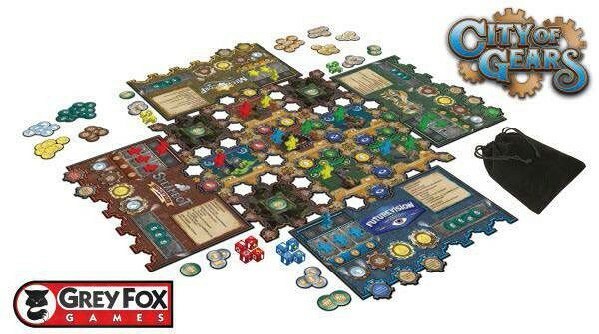 Era: Medieval Age: Matt ‘Pandemic’ Leacock returns with a spiritual successor to Roll Through the Ages. The designer takes us through his upcoming ‘roll-and-build’ dice game. L’Attaque: Discover the forgotten story of the strategy classic that inspired Stratego and was played by Winston Churchill. How to Host the Perfect Game Night: We put together our readymade recipes for unforgettable evenings spent with friends around a table. Things from the Flood: The sequel to acclaimed RPG Tales from the Loop is moodier, darker and deadlier. We speak to its creators about moving into an alternate nineties and give our thoughts in a full review. War of the Worlds: The New Wave: The Martians are back! As tripods invade Scotland, we get to grips with the asymmetric head-to-head deckbuilder that could save – or doom – humanity. How We Made… Space Cadets: Geoff Engelstein takes us through the frantic co-op sci-fi game he created with the help of his kids. Painting Guide: Grab your bristled wand as we make the Order of the Phoenix in Harry Potter Miniatures Adventure Game look magical. All the Jahres: Join us as we stop off on our next destination through all the winners of the biggest prize in games: Ticket to Ride. Reviews Wingspan Genesys: Shadow of the Beanstalk – the Android RPG Marvel Strike Teams: HeroClix Strategy Game Treasure Island Core Space City of Gears Vadoran Gardens BattleTech Dungeons & Dragons: Vault of Dragons Lindisfarne Swordcrafters: Expanded Edition Dual Powers: Revolution 1917 + many more!